Winning of "Okochi Memorial Technology Prize"(2017 FY) －Development of Transmission Electron Microscope with Automatic Aberration Correction and Super High Resolution－ | News Release | JEOL Ltd.
JEOL Ltd. (President Gon-emon Kurihara) received the 64th (2017 FY) "Okochi Memorial Technology Prize" from the Okochi Memorial Foundation (Japan), for the JEM-ARM300F Atomic Resolution Electron Microscope. The Prize, initiated from 1954, is a significantly high-prestige technology prize. Winning of this prize is very honorable to JEOL. The main technological features of the JEM-ARM300F are presented below. Transmission Electron Microscope (TEM) has been developed and advanced as a significantly essential tool in the developments of structural materials (e.g. iron & steels, ceramics, plastics) and of functional materials (semiconductors, catalysts, etc. 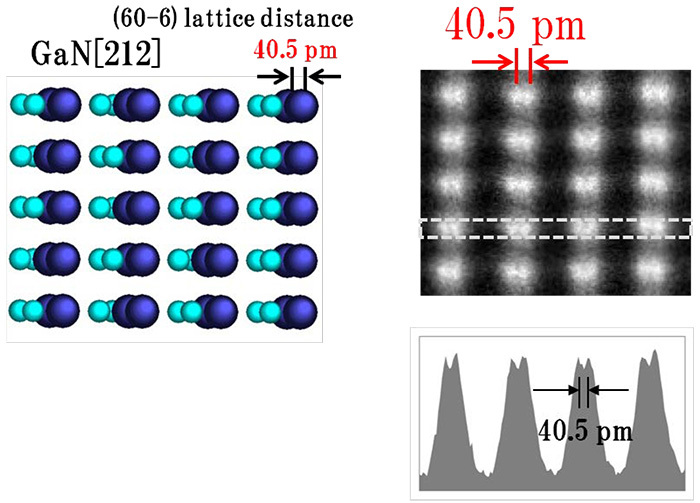 ), because the TEM clearly visualizes the sub-nm structures of the materials and provides a great deal of information. TEM users have been increasingly requesting multi-functionality and the best-in-class spatial resolution with high throughput. Focused on those requests, the JEM-ARM300F, a multi-purpose, atomic-resolution analytical microscope, was developed based on high-end technologies accumulated in JEOL. This superbly-sophisticated microscope updated the resolution in the world, owing to JEOL’s cutting-edge aberration correction technology. The unrivaled resolution of the JEM-ARM300F was achieved by a number of novel technologies. Among them, the three main technologies are as follows. 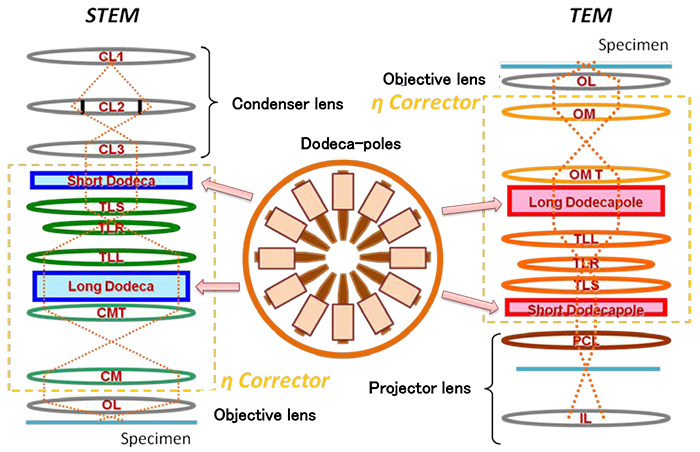 The JEM-ARM300F is equipped with an innovative, dodeca-pole based aberration corrector, called the Expanding Trajectory Aberration Corrector (ETA(η) Corrector) (Fig. 1). The strengths of magnetic fields applied to 12 poles are optimally controlled, by an automated aberration control system. The feature of the ETA(η) Corrector also reduces the higher order aberrations and chromatic aberration. 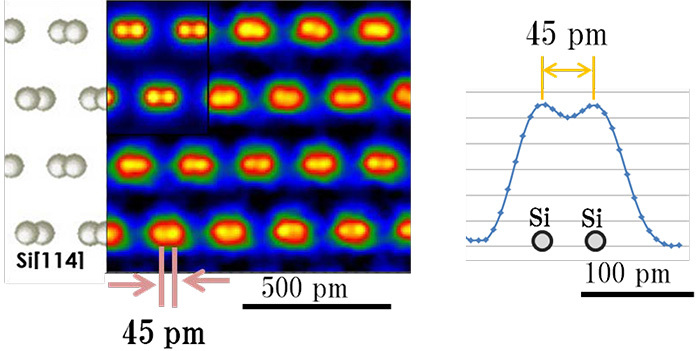 Residual aberrations can be automatically measured by using only two Ronchigrams of an electron probe converged onto the specimen. Utilizng this cutting-edge capability, the SRAM (Segmented Ronchigram Autocorrelation function Matrix) method (patent No. 4790567) was developed. Compared with conventional aberrration measurement methods, the SRAM method provides overwheilmingly high throughput for aberration correction. The method also enables the aberration correction using the specimen of user (not standard specimens), thus eliminating the procedure of specimen exchange. A high quality vacuum system, which achieves the pressure of the electron-gun chamber around 10-8 Pa to 10-9 Pa, was successfully realized, enabling stable operation of a high-brightness CFEG. The feature of CFEG, small energy spread, also enhances the image resolution by suppressing image blur due to chromatic aberration. Owing to revolutionized various improvements mentioned above ( 1) spherical aberration corrector, 2) aberration control system and 3) CFEG), the JEM-ARM300F demonstrated the world’s record of image resolution as of 2015 (resolving an atomic column with lattice distance of 45 pm, viewed from Si ) (Fig. 2). We have made further efforts aiming at higher resolution after this achievement. And we developed the Delta corrector which is an aberration corrector enabling to compensate higher order aberrations. In 2017, we broke the world’s record to 40.5 pm (atomic column viewed from GaN ) (Fig. 3). Those accomplishments are dramatically contributing to a wide range of scientific fields. This innovative aberration-corrected TEM will extend applications of atomic-level imaging to various fields of energy, life science and drug discovery, all of which are challenges for a human being, as well as to developments of new materials in air craft, semiconductor and other mega-market industries. Thus in the long-term, the JEM-ARM300F will be expected to play a significant role in the progress of cutting-edge basic research and scientific technology.